Yes — You, Too, Can Build a Custom Field Control! 10/29/2012 20:45 / 1 Comment on Yes — You, Too, Can Build a Custom Field Control! Ever since I started building websites in Sitecore over five years ago, I had an itch to build a custom Sitecore Field Control. Sadly, I never put my nose to the grindstone in doing so until a few weeks ago. 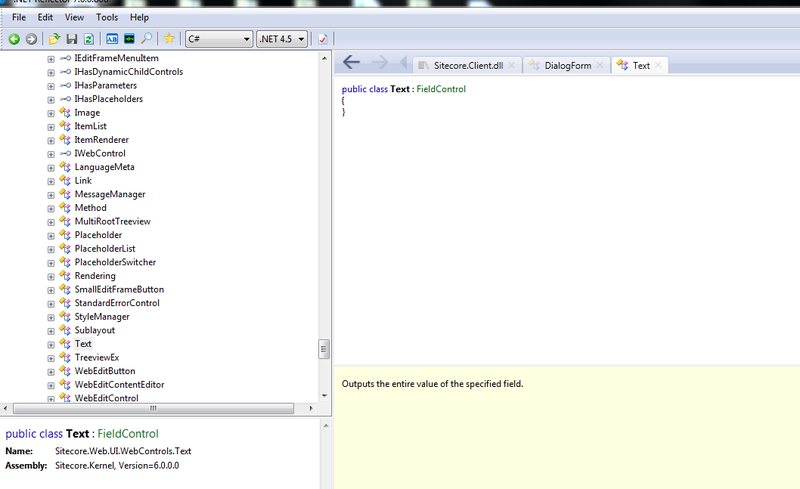 Armed with .NET Reflector and the Sitecore.Kernel.dll, I sat down and finally built one. This post highlights the fruits of my endeavor. First, let me give you a quick description on what a Sitecore Field Control is. A Sitecore Field Control is an ASP.NET Web Control that presents data set in a Sitecore field according to logic defined by the control. Sitecore offers a few Field Controls out of the box — these include Image, Link, Text, Date — and all are defined within the namespace Sitecore.Web.UI.WebControls. 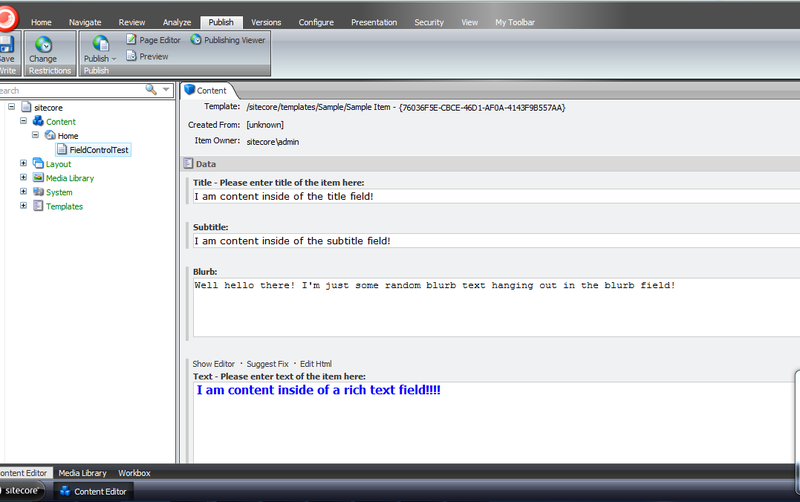 How to use these Field Controls is illustrated during Sitecore Developer Training and certification. 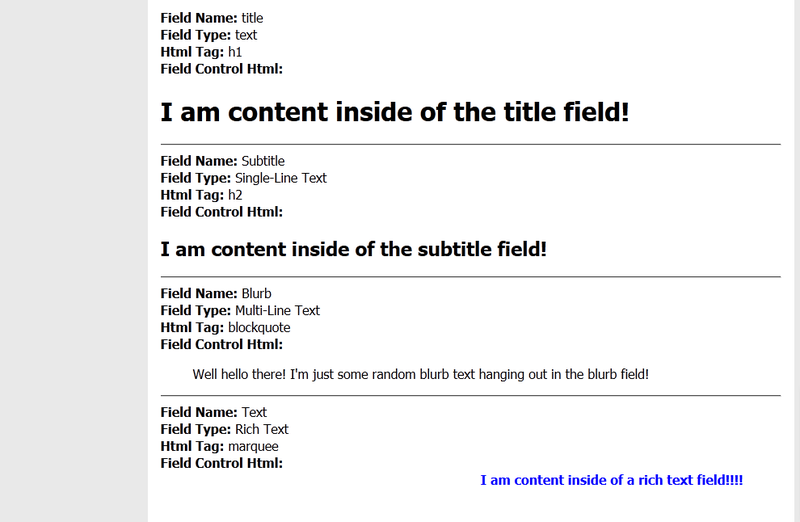 In this example, I created a custom Field Control that takes a value set within a Single-Line Text, Multi-Line Text, Rich Text, or text field — a deprecated field type used before Sitecore v5.3.1. — and wraps the value around HTML specified by client code. This HTML tag is defined by the HtmlTag attribute of the HtmlTagFieldControl below. Sitecore offering the ability to create custom Field Controls is just another example of its extensibility. I don’t know of many developers that have taken advantage of creating their own custom Field Controls. However, I hope this post kindles the want for doing so, or adds some armament to your arsenal on how to present Sitecore data. Custom field controls – would you write your own from scratch, or inherit e.g. sc:text and add what you need (and why)? The Text FieldControl doesn’t offer any logic over it’s FieldControl base — it inherits directly from the FieldControl class without any overrides. Inheriting from it will not add any extra benefit. Further, the only method that might be of interest in overriding in a FieldControl base class — a class other than Text — would be the PopulateParameters method — albeit an argument could be made for overriding the DoRender method, but I will not discuss this method here. The PopulateParameters method sets parameters that are used by the RendererField pipeline for passing arguments to the Renderer object — the latter object creates the HTML for the control. Plus, as a general best practice, I would caution against inheriting from classes unless absolutely necessary — more specific FieldControl classes within Sitecore.Web.UI.WebControls are no exceptions. You don’t want to introduce a steep class hierarchy, or cause class explosion — a situation where you create a new class just to add new functionality over a base class (Vlissides, Helm, Johnson, Gamma, 1995; Shalloway and Trott, 2004). Utilizing composition is recommended over inheritance — a model that faciliates in code maintenance, refactoring efforts, and adding new functionality (Vlissides, Helm, Johnson, & Gamma, 1995; Shalloway & Trott, 2004). The real magic though occurs within the Renderer and RenderField pipeline classes, not the FieldControl classes, per se. Shalloway, A., Trott, J. A. (2004) Design Patterns Explained. A new Perspective on Object-Oriented Design (2nd edition). Reading: Addison-Wesley.